The new Microsoft Band is probably the most ambitious activity tracker I've ever seen: It jams 10 sensors into one slim wristable. But after strapping it on for the first time, I really feel that it's more than just another handsome little metrics bracelet; it's actually got the brains to tell me what to do with them. 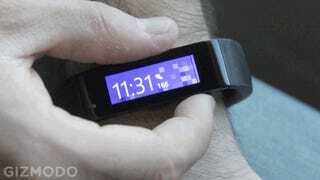 At its most basic level the $200 Microsoft Band is an activity tracker that's on par with others that you've seen. It measures your heart rate, your steps, and calculates certain pieces of relevant health data like calories burned. Straps like that have been around for years now, and continue to improve. But the Microsoft Band's also doubles as a reference design for the company's ambitious Microsoft Health platform, supporting a whole army of wearables that wants to take all your data, crunch it with the cloud, and hand you back actionable information. Though I obviously haven't had the chance to push the device to the max, here are my first impressions. Probably the cleverest part of the hardware design is the sliding clasp, which you can adjust depending on your activity. In a more casual situation, you might loosen it up, and then when you want to go for a jog, you can easily tighten it so that it's not flopping around. Tightening also creates better contact for the optical heart rate sensor. Once it's on, the band has a very slim footprint when you're looking at it from above, but it's actually got a little chunk on the profile. You interact with its through a basic sleep/wake button, an "action" button for initiating runs or other workouts, and the touchscreen. As soon as you wake the device up it shows you the time, and by pushing the action button, you navigate from there through a number of basic metrics like steps, heart rate, and calories, which are displayed in tiny print next to the time. Give that home screen a swipe, and you're delivered to a drawer where you can scroll through a series of wonderfully Metro tiles that look like they could have been peeled straight from Windows Phone. The screen is nicely responsive, although, a very discerning user could quibble that the swipe animation is a tad choppy. The tiles lead the way to some pretty basic smart-wearable information. The device pairs with your phone over Bluetooth, and pulls info like notifications, missed calls, and your calendar. The slim screen can only squeeze a phrase worth of info. It's enough to know what's going on, but don't imagine yourself reading whole emails or anything. Getting your next appointment on your wrist is handy, but it's nothing new. The Microsoft Band really starts to impress you when you get beyond the basics to the powerful health-monitoring powers built in. Further down the list of tiles are icons that point you to special functionality for running, sleeping, as well as to a workout trainer. The latter is truly unique. Using the Microsoft Health app (available for Android, iOS, and Windows Phone), you can load a workout plan on to the device. When you activate a workout, it guides you through one step at a time. When you're doing something like pushups, it can tell by the motion how many you've done. For example, I'm a slob, so I chose beginner workout, and when I fired my band up, it timed me for 20 seconds of jumping jacks, and gave me a buzz on my wrist, before giving me a short rest period. Then, it lead me to a series of squats. It's basically a personal trainer on your wrist. The workouts appear to be curated strictly by Microsoft right now, but presumably, a Microsoft Health SDK, which will be available early next year would let allow devs to port other workouts over to the device. The running and sleep tracking work as you would expect. One particularly nice touch worth noting is that the built-in GPS radio isn't always on so you're not always sucking down battery. When you tell the Microsoft Band that you're going for a run, it prompts you to turn it on. And you don't have to wait. It encourages you to start running, and it'll get to GPS when it finds the signal. 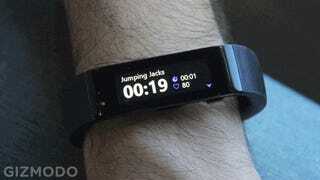 All of this workout functionality and health tracking points to what really makes the Microsoft Band unique. More than any other wristable out there, it's trying to turn its tracking into a dialogue with you. Most devices just collelct metrics from your body and notifications from your phone only to yell them back to you. 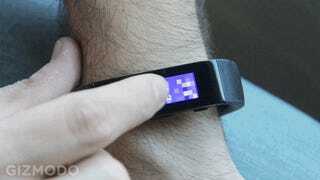 The Microsoft Band wants to give them back to you in useful form. In large measure the intelligent dialogue Microsoft is trying to build is firmly tied to the Microsoft Health platform. Microsoft doesn't just want to serve as repository for your health data—it wants to crunch it and give you an insight. Some of this functionality has already been developed. For example, the Microsoft Health app doesn't just tell you how much sleep you got, there is further calculated metric for "restful sleep." Another example: After you do a workout, the app crunches your body weight, heart rate during the workout, and other data and tells you what your recovery time will be. Microsoft chews through all of this data in the cloud, and the platform will get smarter and smarter as it gets more experience. It'll also supposedly start integrating information from other Microsoft Platforms. For example, in one humorous example that was suggested to me, the Band might be able to pull down your calendar information from Office 365 sync it with Microsoft Health, realize you've got a meeting with your boss coming up soon, and suggest you taking a breather so you don't get too stressed out. Eventually, Health might be able to suggest what music to play on Microsoft Music to chill you out before the big one-on-one, too. I've got a lot of work to do before we've really put the Microsoft Band to the test, but at a glance, it's perhaps the most intriguing wearable we've seen all year. It strikes a nice balance between ambitious—it's very, very ambitious—and actually usable. My sense, in short, is that if you are a human on Earth, the Microsoft Band will help make you a better one. Or at the very least, fitter.